THE MONKEY BARS ARE ANOTHER UPPER BODY STRENGTH KILLER CHALLENGE – GO APE WITH YOUR PREPARATION, AND YOU MIGHT JUST STAND A CHANCE! Bend your knees, jump big and reach for the bars – swing back and forward to gain momentum and then use this to help you across the challenge. Want to get really serious with this one? Then skip some bars, lightweight! 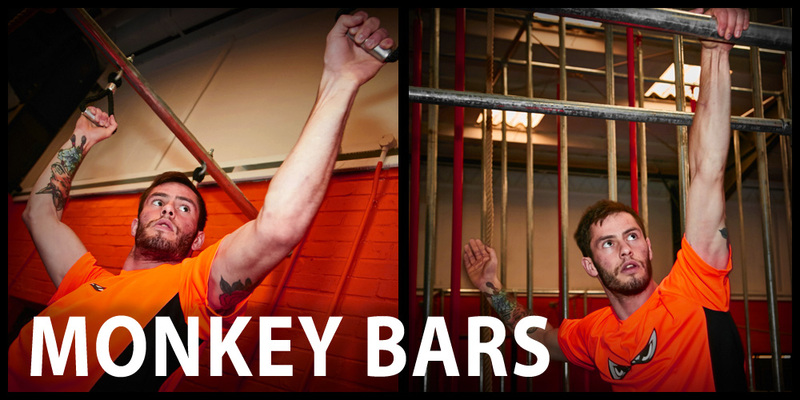 Check out the training tips below then book a ninja training session to perfect your monkey bar technique – or if you think you can conquer the whole competition course book yourself a time trial and show us what you can do, against the clock!